My husband is an aerospace engineer, so we often geek out over science things. In fact, the chances of there being a discussion about science and technology over the dinner table is pretty high. The other day we were out to breakfast and, as any normal family does, we started building a coffee creamer tower. You know those little cups of creamer that are always in a bowl on the table? They became the foundation (quite literally!) of a tower that led to discussions on structure, stability, balance, and more. Our three girls have come to expect these types of conversation twists and, I hope, are enjoying them. So, when a friend mentioned that she was going to buy a ton of science kits and supplies for her kids to keep them busy during their time off from school, I got to thinking about what’s really needed for a good STEM (Science Technology Engineering Math) experiment. Are fancy kits necessary? Does a more expensive roll of duct tape really make a difference? Should people really be buying expensive supplies to complete the most basic of experiments? My answer is no! If you’re looking for ways to integrate some STEM fun into your kids’ lives, build and explore with the materials you have on hand. Here are some of the “around the house” supplies that have made their way into our science experiments. Remember when these were called pipe cleaners? Well, they may have gotten a fancy new name, but these fuzzy sticks are great for building, twisting, turning, and manipulating into new structures. Even one lone chenille stick can change the stability of an impromptu structure! You may think that paperclips are only for holding together piles of paper clutter, but, alas, they are not! Paper clips are easily bendable and, when you experiment with different size and thicknesses, your building and structures can take a new twist. If you have any around, try using the decorative, plastic coated paper clips too – they add a bit of dimension and a different type of stability to your building project. Also called craft sticks and available in a box by the thousands, these sticks are great for stacking, testing weight loads, and building different structures. As with the paper clips, it’s fun to experiment with wider, longer, and even different colored sticks, as they often offer slight variations and provoke some great discussions – like, “Why is the longer, thinner popsicle stick able to support a different amount of weight than the shorter, more narrow one?” You don’t have to buy a box of these though – just get some popsicles and save and wash the sticks that are left over! Do you get the newspaper? 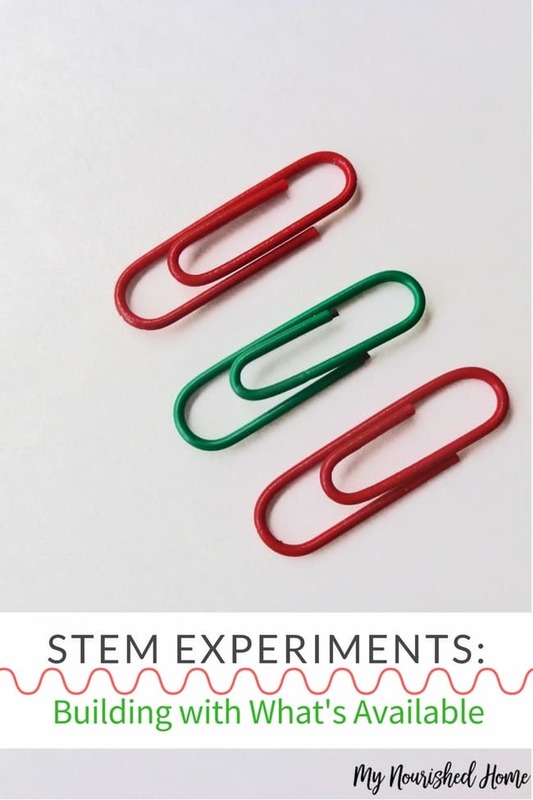 Take the rubber band off and start a rubber band collection for your STEM experiments! They vary in elasticity and durability which makes them interesting building and experimenting materials! Roll them, fill them, and build with them! Water bottles and their caps are excellent experiment materials. We love filling them with different materials (sand, dirt, water) and testing their strength and stability. It also gives my girls a chance to figure out how best to fill them – with a funnel, a spoon, or something else? It keeps them thinking and engaged. 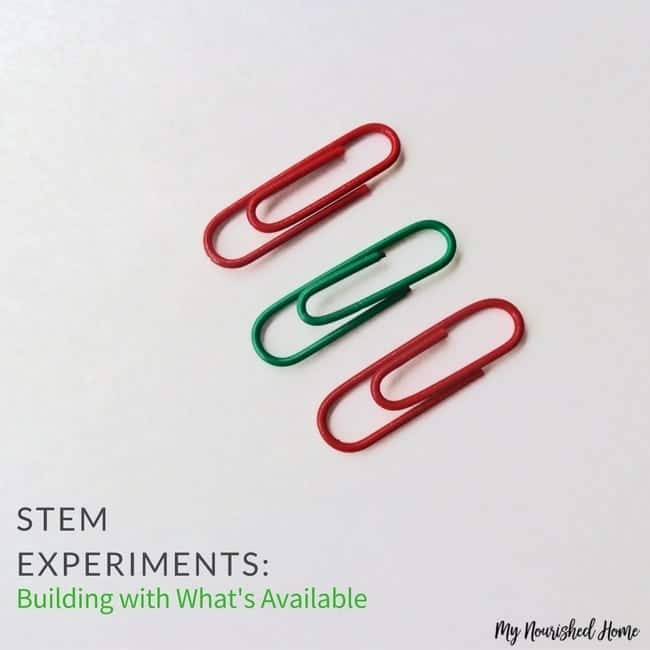 There are hundreds of other things around the house that you can use to turn a dreary day into a STEM celebration, you just need to think about things a bit differently. Experiment with every day objects around your house and see how your perspective changes when it comes to materials and their uses. Now, go build with some coffee creamers!